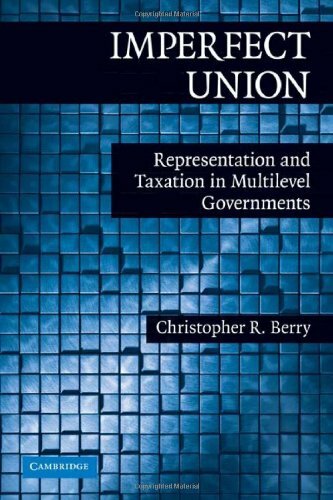 Imperfect Union: Representation And Taxation In Multilevel Governments: 9780521764735 Hardcover - LIMEROCK BOOKS INC. This book offers the first political theory of special purpose jurisdictions, including 35,000 special districts and 13,500 school districts, which constitute the most common form of local government in the United States today. Collectively, special purpose governments have more civilian employees than the federal government and spend more than all city governments combined. The proliferation of special purpose jurisdictions has fundamentally altered the nature of representation and taxation in local government. Citizens today are commonly represented by dozens - in some cases hundreds - of local officials in multiple layers of government. As a result, political participation in local elections is low and special interest groups associated with each function exert disproportionate influence. With multiple special-interest governments tapping the same tax base, the local tax base takes on the character of a common-pool resource, leading to familiar problems of overexploitation. Strong political parties can often mitigate the common-pool problem by informally coordinating the policies of multiple overlapping governments. Special purpose jurisdictions, such as school districts, water districts, and transit authorities, constitute the most common form of local government in the United States today. This book offers the first political theory of special purpose jurisdictions and provides extensive empirical analyses of the politics and finances of these often overlooked but increasingly influential governments.